Good Afternoon Messages : It doesn’t hold us back to wish our close ones whatever it is a good noon or any other time of the day. When it is exactly half of a workday and stress or drowsiness knock down the energy of your precious person then you may inspire him/her by some noon quotes or sweet good afternoon messages. Let help your friends, relatives, colleagues, boyfriend, girlfriend or well known person have the perfect break to take rest at this shining afternoon and wish them by good afternoon messages which could make them feeling refreshed. Send your loved one your heartfelt best wishes to Have a Good Day! With a deep blue sky over my head and a relaxing wind around me, the only thing I am missing right now is the company of you. I wish you a refreshing afternoon! 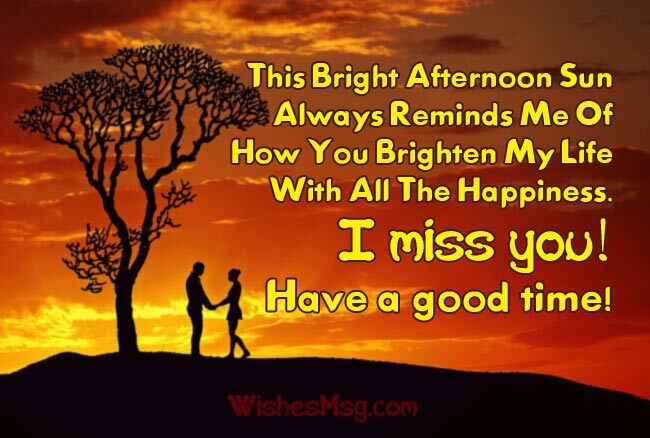 This bright afternoon sun always reminds me of how you brighten my life with all the happiness. I miss you a lot this afternoon. Have a good time! The gentle afternoon wind feels like a sweet hug from you. You are in my every thought in this wonderful afternoon. Hope you are enjoying the time! Wishing an amazingly good afternoon to the most beautiful soul I have ever met. I hope you are having a good time relaxing and enjoying the beauty of this time! Nature looks quieter and more beautiful at this time of the day! You really don’t want to miss the beauty of this time! Wishing you a happy afternoon! 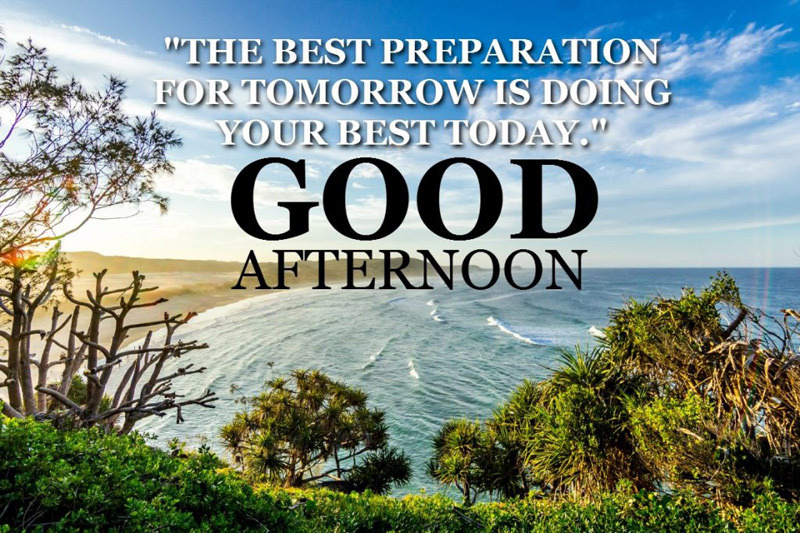 Afternoon has come to indicate you, Half of your day’s work is over, Just another half a day to go, Be brisk and keep enjoying your works, Have a happy noon! Mornings are for starting a new work, Afternoons are for remembering, Evenings are for refreshing, Nights are for relaxing, So remember people, who are remembering you, Have a happy noon! This afternoon is the time where you can fulfill that dream you have had some time now, you can always do it, take this opportunity, good luck in your afternoon. If you feel tired and sleepy you could use a nap, you will see that it will help you recover your energy and feel much better to finish the day. Have a beautiful afternoon! 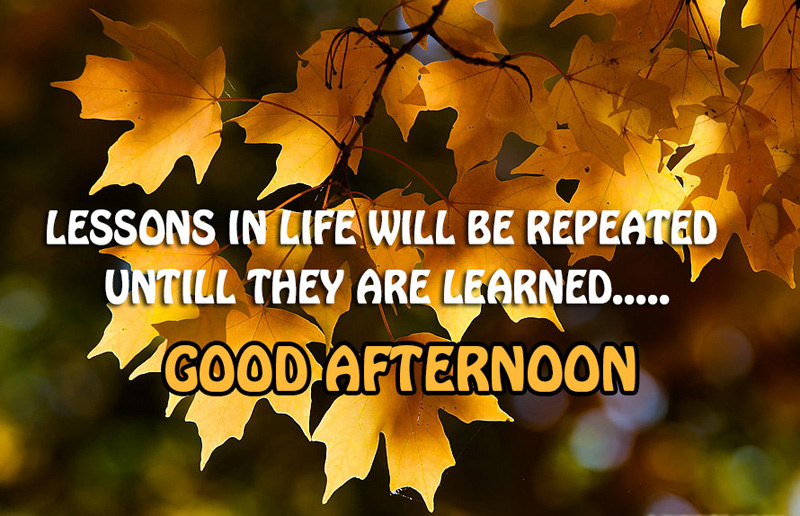 Sweet things to be remembered, Good things to be remembered, Nice persons to be remembered, Afternoon is the best time for it, Just think of me all the above will be get done, Good noon! Noon time – it’s time to have a little break, Take time to breathe the warmth of the sun, Who is shining up in between the clouds, Good afternoon! We should contemplate more sunsets next to the people we want as many of them to look like beautiful paintings that nature gives us to contemplate, relax and reflect. Good afternoon! Time to remember sweet persons in your life, I know I will be first on the list, Thanks for that, Good afternoon my dear! My wishes will always be with you, Morning wish to make you feel fresh, Afternoon wish to accompany you, Evening wish to refresh you, Night wish to comfort you with sleep, Good afternoon dear! You are the cure that I need to take three times a day, in the morning, at the night and in the afternoon. I am missing you a lot right now. Good afternoon! Thinking of you is my most favorite hobby every afternoon. Your love is all I desire in life. Wishing my beloved an amazing afternoon! You are every bit of special to me just like a relaxing afternoon is special after a toiling noon. Thinking of my special one in this special time of the day! I pray to god that he keeps me close to you so we can enjoy these beautiful afternoons together forever! 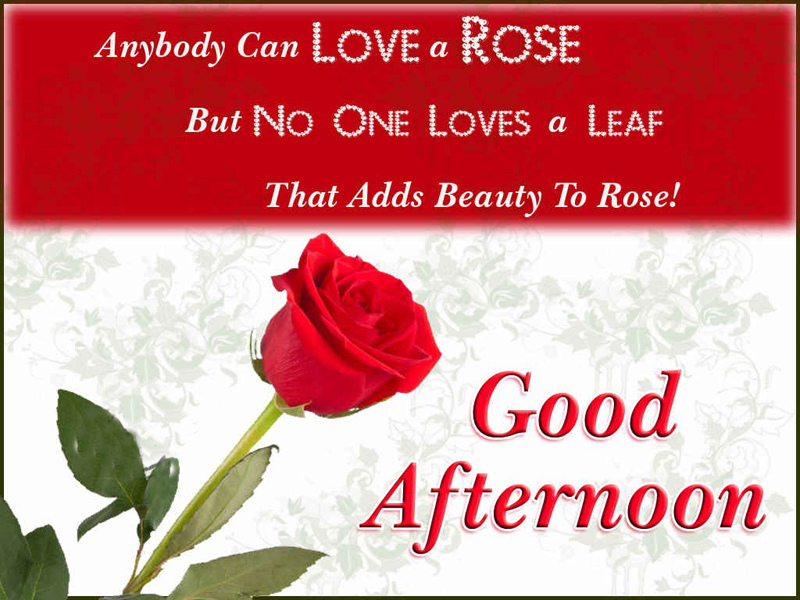 Wishing you a good time this afternoon! I want you when I wake up in the morning, I want you when I go to sleep at night and I want you when I relax under the sun in the afternoon! How I wish the sun could obey me for a second, to stop its scorching ride on my angel. So sorry it will be hot there. Don’t worry, the evening will soon come. I love you. I have tasted things that are so sweet, heard words that are soothing to the soul, but comparing the joy that they both bring, I’ll rather choose to see a smile from your cheeks. You are sweet. I love you. With you every day is my lucky day. So lucky being your love and don’t know what else to say. Morning night and noon, you make my day. Your love is sweeter than what I read in romantic novels and fulfilling more than I see in epic films. I couldn’t have been me, without you. Good afternoon honey, I love you! No matter what time of the day it is, No matter what I am doing, No matter what is right and what is wrong, I still remember you like this time, Good Afternoon! Things are changing. I see everything turning around for my favor. And the last time I checked, it’s courtesy of your love. 1000 kisses from me to you. I love you dearly and wishing you a very happy noon. You are sometimes my greatest weakness, you are sometimes my biggest strength. I do not have a lot of words to say but let you make sure, you make my day, Good Afternoon! Every afternoon is to remember the one whom my heart beats for. The one I live and sure can die for. Hope you doing good there my love. Missing your face. My love, I hope you are doing well at work and that you remember that I will be waiting for you at home with my arms open to pamper you and give you all my love. I wish you a good afternoon! Sleeplessness at night is not always a medical condition for some people. Sometimes it’s the punishment from God for those who sleep during such a beautiful afternoon! I was enjoying this beautiful afternoon so much when I thought of you and said to myself, that idiot friend of mine must be sleeping. What a misfortune of you to miss such a beautiful afternoon! If you want to skip the hectic noon every day in your life, you sleep late at night and wake up after the noon. Good afternoon my friend. You’re doing it so right! You can go to your balcony and take a deep breath, have a look at the bright sky and make plans for tomorrow. But instead, you decide to take a nap. That’s a good afternoon for you, my friend! I don’t always say good afternoon to anyone, but when I say, I say it to mean that I’m ready for the afternoon party! SUCCESS is century make it, PROBLEM is yorker face it, FAILURE is bouncer leave it, LUCK is full toss use it, but an OPPORTUNITY is a free hit never miss it, Good Afternoon my friends. My friends, it is already late and soon the workday will come to an end, so it is time to make a last effort and prepare ourselves to go back home. I hope you have a good afternoon. There are no mistakes, No coincidences, All events are blessings given to us to learn, A journey of a thousand miles started with only one step. Good Afternoon! I hope you had a wonderful morning with my morning wishes, Here I am sending my afternoon wish to you to have awesome noon, Happy noon my dear friend! There are good and bad moments, but when a friend is next to you everything is different, joy becomes more immense and sadness is easier to cope with, so I wish you a very happy afternoon dear friend. I wish you have a nice afternoon, perform activities in which you feel comfortable and happy and surround yourself with the people that you love the most. Life is a magic, The beauty of life is next second, Which hides thousands of secrets. I wish every second will be wonderful in your life. Good Afternoon! The Morning spent with your family, The afternoon spent with your works, The evening spent with your friends, The night spent with your dreams, All make a perfect day, Have a happy noon! Let go of all your sadness and light up your world with the brightness of this afternoon. You have miles to go still. I wish you an afternoon that’s full of inspiration! Good times always show up after the hardest time in your life. Just like a relaxing afternoon takes place after a hectic noon. Wish you all the best for the coming days. The afternoon is a perfect time to recharge your drained-up self after a toiling day. This afternoon is all for you to take a deep breath and start the journey once again. You are a blessed soul if you are still alive to experience this amazing afternoon today. Take your inspiration from this bright sun and make your life wonderful. This afternoon is a reward for you after a restless day. Expose yourself to this refreshing afternoon wind and let it fill you with hope, dream and determination. Good afternoon! You could get a simple idea one afternoon that could completely change your life. Great innovators just needed one idea to change everything. Keep striving and you will reach success. Denotation of noon is not just only medial of the day but it is the impenetrable time to do anything in our life. So covering this noon happily, good afternoon. I hope you have a nice afternoon and that you keep up your optimism because the mind is powerful enough to do great things. There are few hours in life more agreeable than the hour dedicated to the ceremony known as afternoon tea. Take it and energize yourself for rest of the day. Be bright like the afternoon sun and let everyone who sees you feel inspired by all the great things you do. You have one life here on earth. Make it count in whatever way you can. Good AfterNoon! Fall in love with the energy of the mornings, trace your fingers along the lull of the afternoons, take the spirit of the evenings in your arms kiss it deeply and then make love to the tranquility of the nights. I hope things have been very good in the morning, but if they were not, so do not worry, you still have a few hours in the afternoon to finish the day in the best way. I miss you very much and I send you all my good vibes. As the noon comes with it’s shining rays at the middle of the day you should wish your desired one to fulfill his/her work with great effort and greet them by good afternoon messages to uplift their spirit. 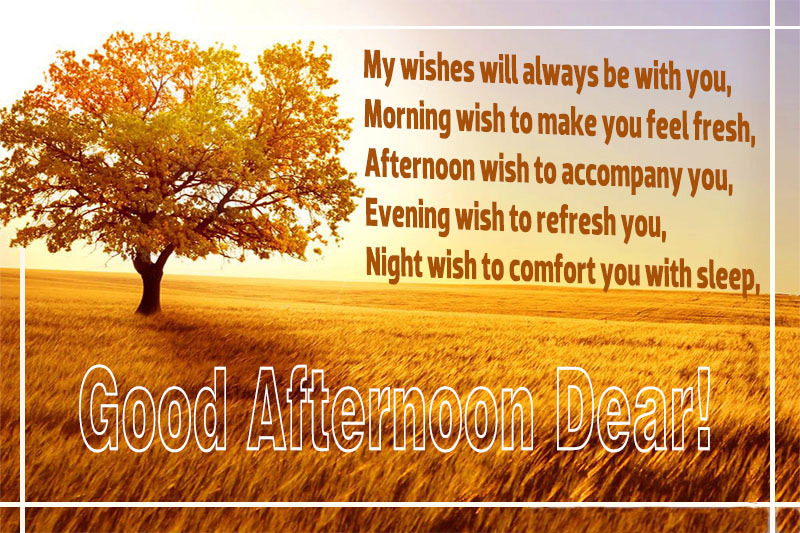 We hope you have found these good afternoon wishes and messages helpful to make a good wish for your special someone.